Kiss your razor goodbye forever! You can remain confident and comfortable in your smooth, beautiful skin all the time. 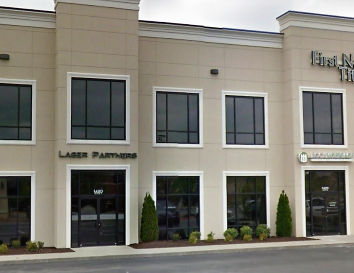 Laser Partners offers laser hair removal that is fast, easy and effective. No more waxing or plucking, irritating ingrown hairs, and no more “forgot to shave” moments. It’s gone for good and we’d love to help you bring this dream to life. Our Fayetteville branch is conveniently located in the same parking lot as Mellow Mushroom next to First National Title on E Augustine Lane and N Vantage Drive. If you walk in our doors for hair removal, body contouring, or your laser facial needs, you’ll leave a different more confident person. Guaranteed. How Does It Work What Kind Of Laser Do We Use For Hair Removal? The process is painless, easy and fast, so unwanted hair will quickly become a thing of the past. Our state-of-the-art Candela GentleMax Pro is the gold standard in laser hair removal and is the leading hair removal brand chosen by dermatologists. Our laser delivers a brief intense beam of light which is absorbed by the hair follicle and converted into heat. The heat damages the follicle preventing further hair growth. Surrounding tissue remains unaffected and unharmed. How Do I Need To Prepare For My Hair Removal Appointment? Laser Tattoo Removal – Our experienced tattoo removal professionals use the most advanced technology in the industry, guaranteeing superior tattoo removal results and experiences during each and every visit. Skin Tightening – Have excess skin sagging from a particular area of your body? No problem, our laser tightening methods will have you looking great again in no time. Cellulite Reduction – 80% of women have cellulite, a result of fat cells that leave a rippling effect on the skin. Our methods of reducing cellulite are the safest and most effective treatments in the industry. IPL (Photofacial) – If aging, acne, or too much time in the sun has left your face with blotches, scars, wrinkles, or lines, photorejuvenation will help your skin. Hollywood Facial – Discover the most talked about facial anywhere that has become the new buzz of non-invasive skincare treatments offered today. It’s fast, effective and there is zero downtime. Hydrafacial – Nonirritating treatment that exfoliates and hydrates the skin with a moisturizing serum, gently removing impurities. RF Microneedling – State-of-the-art technique used to achieve non-surgical skin rejuvenation. It promotes the growth of collagen in the treatment area, which helps tighten the skin and improve its overall texture and appearance. Teeth Whitening – Brighten your smile to its former glory with this fast and effective method making your teeth up to 8 shades whiter in just one visit!